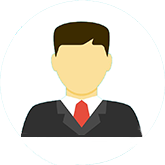 and section 302 of the Indian Penal Code and also under section 4(b) of the Explosive Substances Act read with section 6 of that Act and with section 120-B of the Indian Penal Code at a trial commencing from 5th May, 1930, and ending with the 7 October, 1930, is hereby sentenced to Death. This is to authorize and require you, the said superintendent , to carry the said sentence into execution by causing the said BHAGAT SINGH to be hanged by the neck until he be dead at Lahore on the 27th day of OCtober, 1930 and to return the warrant to the High Court, with an endorsement confirming that the sentence has been executed. Given under our hands and the seal of the court, this 7th day of October, 1930. 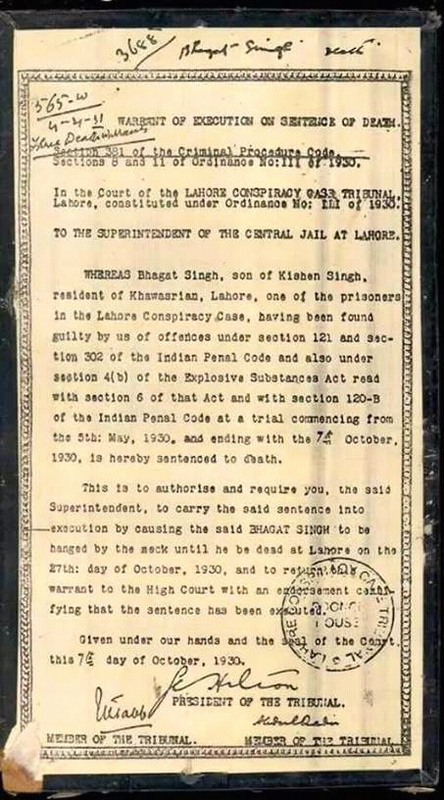 Whereas Bhagat Singh son of Kishan Singh, resident of Khawasrian, Lahore, one of the prisioners in the Lahore Conspiracy Case, having been found guilty by us of the offences under section 121 and section 302 of the Indian Penal Code and also under section 4(b) of the Explosive Substances Act read with section 6 of that Act and with section 120-B of the Indian Penal Code at a trial commencing from 5th May, 1930, and ending with the 7 October, 1930, is hereby sentenced to Death. This is to authorize and require you, the said superintendent , to carry the said sentence into execution by causing the said BHAGAT SINGH to be hanged by the neck until he be dead at Lahore on the 27th day of OCtober, 1930 and to return the warrant to the High Court, with an endorsement confirming that the sentence has been executed.